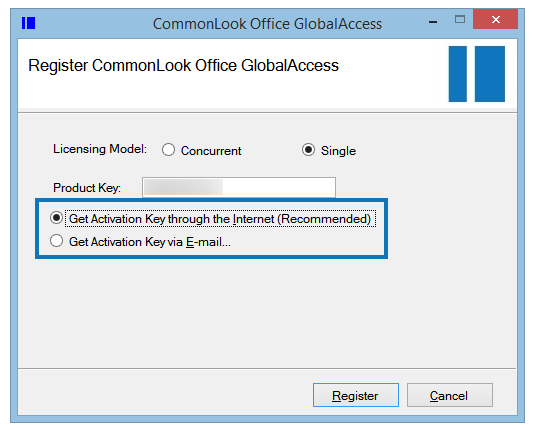 Note: The information and steps outlined below are for installing and activating the Single User licensing model of CommonLook Office on your machine. 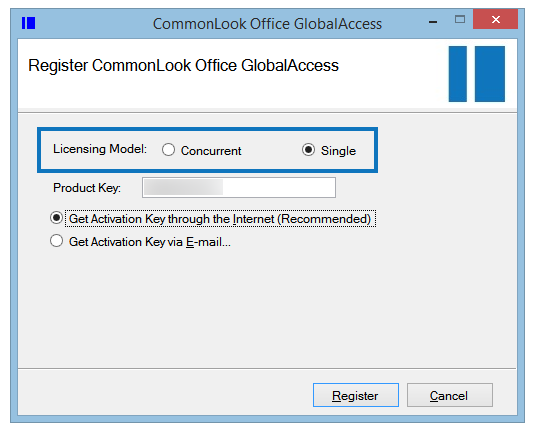 If you need to install and use the Concurrent User licensing model, please contact us at support@commonlook.com for that installation information. Copyright © 2019 NetCentric Technologies Inc.
All rights reserved. No part of this publication may be reproduced, transcribed, stored in a retrieval system or transmitted in any means, electronic, mechanical, photocopying, recording, or otherwise, without prior written permission from NetCentric Technologies Inc.
Windows Internet Explorer version 8.0 or higher. Please read and follow the download and installation instructions carefully! CommonLook Office comes in 32 bit and 64 bit variants. 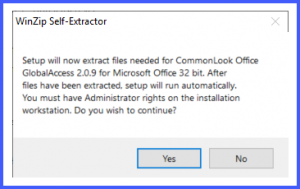 Make sure to use the correct installer for your version of Microsoft Office. Choose the appropriate button below to begin the download. 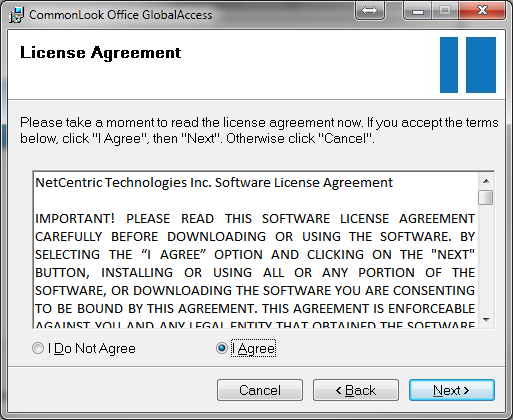 If preferred, contact Sales (sales@commonlook.com) to obtain the software on CD. Important: The installation MUST be performed while logged in to Windows as a user with Administrative Privileges on the local machine. 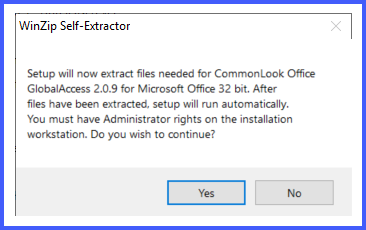 After selecting “Yes” in the “Self-Extractor” dialog, the files needed for CommonLook Office will be extracted. Choose “Install” or “Yes” as needed if asked to install additional components and/or make changes to your machine. Once the extraction process is completed, the CommonLook Office Setup will start. 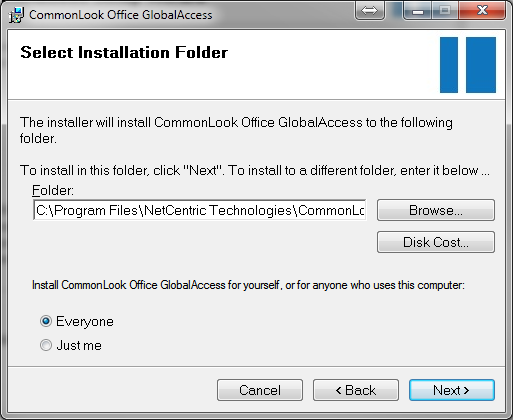 Select “Next” when the CommonLook Office “Welcome” screen opens. 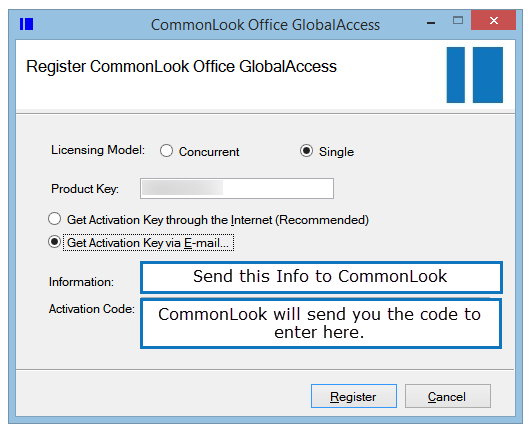 Enter the “Product Key” as supplied by CommonLook in your purchase email. Note: If this is an upgrade from a previous version then the “Product Key” information will already be entered for you. Select whether to get your “Activation Key” by the Internet (the recommended choice) or by email. Note: When choosing to get your Activation key by email, there will be a value entered in the “Information” field below the “Activation by Email” radio button. Copy that “Information” value and email it to support@commonlook.com. Support will promptly reply with an “Activation Code.” Copy and paste your “Activation Code” into that field on this registration screen. After choosing your activation method, select the “Register” button. The “Select Installation Folder” screen allows you to specify the target folder for the software installation. It’s recommended that you use the default. 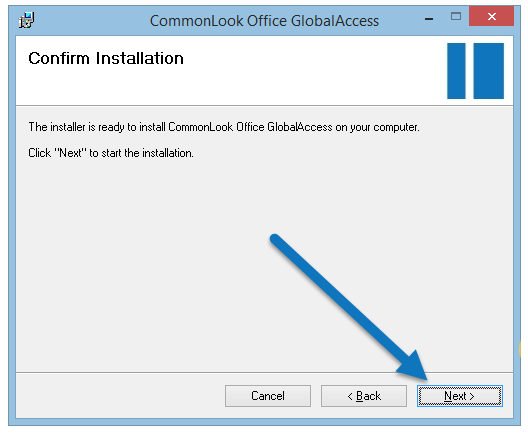 To install CommonLook Office for all users on the current machine keep the “Everyone” radio-button selected. This is particularly important if you are logged on using an account other than the regular machine user’s account (for example, an administrator installing for a desktop user). 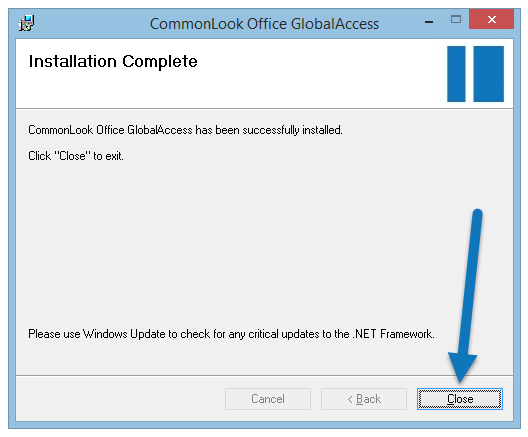 At this stage, all information needed to install CommonLook Office has been collected. The installer will show the “Confirm Installation” screen. Choose “Next” to start the actual file installation. Once the installation is completed, the “Installation Complete” screen will be displayed. Congratulations, you’re now ready to use CommonLook Office! 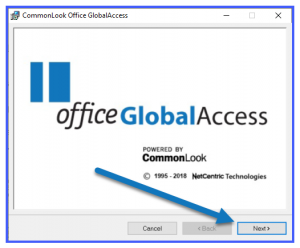 After the software has been installed and registered, you’re ready to use CommonLook Office to create your compliant PDFs from your MS Word documents or PowerPoint presentations. 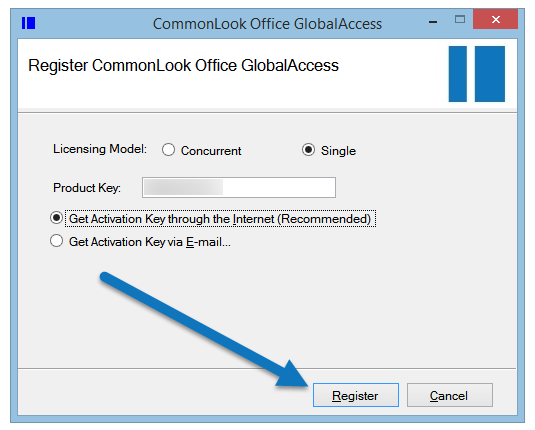 Visit this webpage for help using CommonLook Office in MS Word. Visit this webpage for help using CommonLook Office in MS PowerPoint. 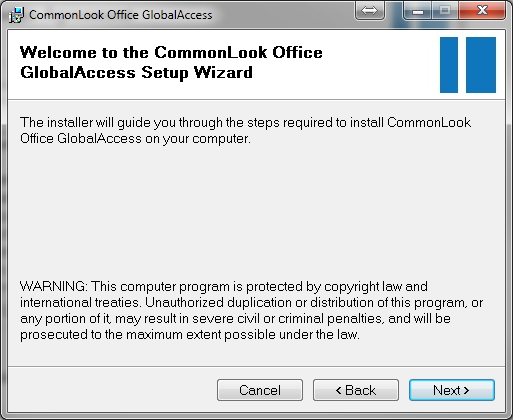 If you encounter any issues during installation/registration, please email support@commonlook.com. Try to include as many details as possible (screenshots are also very helpful) and our support team will assist you promptly. Training is available for MS Word, MS PowerPoint, and the use of CommonLook Office. Visit our Training page for more information. Every effort has been made to make this document as complete and as accurate as possible, but no warranty or fitness is implied. The information provided is on an “as is” basis. NetCentric Technologies Inc. shall have neither liability nor responsibility to any person or entity with respect to any loss or damages arising from the information contained in this document.